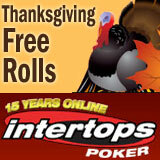 It's Thanksgiving in America this weekend and to celebrate Intertops Poker is hosting five Thanksgiving Free Roll Tournaments and offering a 50% Reload Bonus until Sunday. Players can also get a 50% Thanksgiving Reload Bonus worth up to $300 on their next deposit. This offer is valid until Sunday only and players should enter the bonus code “TURKEY” to claim it. Reload Bonus details are available at http://poker.intertops.eu/en/promotions/#item_1626. In addition to the $1500 total prize pool for the Thanksgiving free tournaments, Intertops is also throwing in some cool bonus prizes. They’ll give $1000 to the player who wins three out of five of the freerolls and $500 to players that win any two of the five. Players finishing in the top five in two or more tournaments will receive an Intertops hoodie and there are t-shirts for those that finish in the top ten in two or more tournaments. These special free roll tournaments will be held on Friday, November 25th and Saturday November 26th at 17:00 and 21:00 EST and on Sunday November 27th at 20:00 EST. For further information see: http://poker.intertops.eu/en/promotions/#item_1628. All players that deposit this weekend and claim the Thanksgiving Reload Bonus will receive one ticket to the $1000 Depositor Freeroll Tournament to be held on December 4th at 17:00 EST. Intertops was one of the first online casino, poker and sportsbook sites on the internet and has been trusted by players around the world for more than fifteen years. Intertops Poker takes pride in its friendly customer service and hassle-free deposits and withdrawals and gives away tens of thousands of dollars in casino and poker bonuses every month.